I’m always looking for new and simple ways to display the kids’ artwork. When I’m presented with a drawing or painting I generally make a quick assessment of the expectation level – fridge? Add it to the art pile? Special gift for Nana? Wall? For pieces that aren’t full-blown frame-worthy (or bag, book, cushion, soft toy or jewellery-worthy) but deserve a little more attention than they’d get sitting on top of the art pile there are Frame Corners. Frame Corners are simple but clever. These colourful wall decals shaped like photo-corners are strong enough to hold up photos or standard paper and are suitable to use on any smooth surface (including the fridge). Each kit comes with seven sets of corners and seven customizable name plates in a variety of colours. The name plates are a nice touch, especially given that I often display the work of four artists in my house. 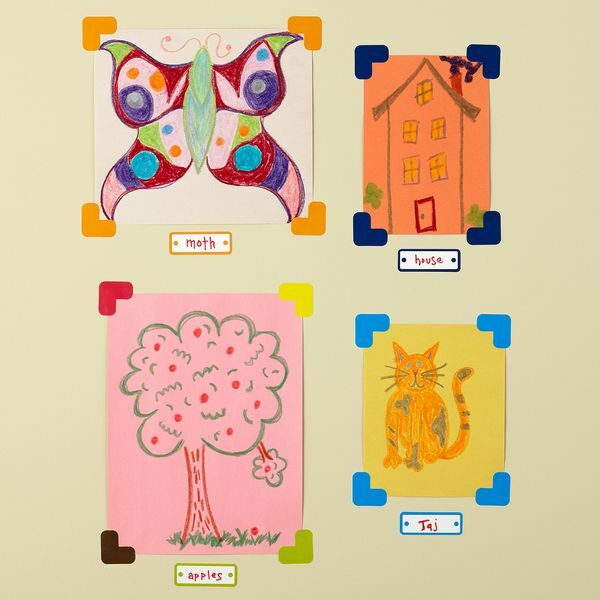 Frame Corners are US$9.95 and are available from The Land of Nod, who ship internationally.